I was driving along surfing channels on XM/Sirius looking for a new, fun station, and was amazed to find an entire channel devoted to the King of Rock and Roll, Elvis Presley! They broadcast live across the street from Graceland, and in addition to Elvis’ songs, they played old and new interviews, behind the scenes footage in the recording studio, etc. What an amazing life he had, and what a legacy he left behind. I’ve always enjoyed Elvis. In addition to the pelvis thing (what’s not to love about that?! ), there was just something about his voice that was somehow authentic, heartfelt and passionate. And that brought me back to my work with animals and the people who love them. I’ve got a fun game that I’ll invite you to play with me. Or “In the Ghetto”… what if an abandoned momma cat or dog was singing it about their homeless, lost, unwanted, hungry babies? I know, I’m hopeless. I’m in love with animals and their plights and situations touch my heart. That’s why I do this important work. We need to understand them, give them a voice, know their pain, their wisdom and their joy. And when we do that, we become better people. 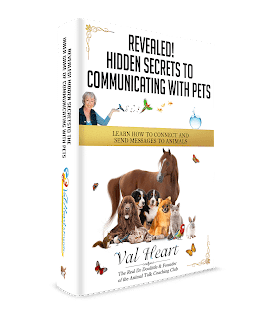 ANNOUNCEMENT: The exclusive and NEW AnimalTalk Coaching Club is OPEN and ready for animal communication students! If you’ve completed a beginning workshop or home study course, then you’re invited to Join Up. Among other things, we play intuitive games, help each other with our animals by practicing communication with each other, AND, you get a LIVE Q&A call with me every month PLUS a LOT of great Bonuses – ALL for a ridiculously low investment ($27/mo). Get started now, before your animals get any older. I do hope you join us. Your animals want to be the true teachers, healers and soul singers they are meant to be. You need to be able to hear their voices, know how to help them heal and fulfill their purpose, and to discover how to create a deeper relationship with your very own master teachers. I know the Courses and the Animal Talk Coaching Club will inspire you, and change your life.